It was a pretty good week for Bay Area fans. The Giants have now won 7 of 8. They drafted some intriguing and exciting new talent. Madison Bumgarner made his return, and Johnny Cueto threw a bullpen. Oh, and this happened. OK, enough about them. Let’s go back to the Giants. I’m going out on a limb, here on June 9, and I’m going to say it. The Giants are good. This is going to be a good season. Where it will end up, I can’t say–they’re right in the thick of it in the NL West, and the AL frontrunners are all beasts. But there is not going to be a repeat of that soul-sucking 2017 season. This team is entertaining and full of surprises. It is also full of championship blood. “…the team to beat.” Well…/thinks about the Astros and the Yankees and the Red Sox and…but we’ll take that vote of confidence–because why not? Can’t spend too much time on this one because off we go again at 9:05 a.m. West Coast time. But it was a beat-down, with the Giants hitting early (three runs in the first two innings) and often (15 hits for the night). And there were a lot of loud hits, with four doubles, a triple, and two homers. In a game with 15 hits, you can’t highlight them all, so we’ll spotlight the big two-run homer by Gorkys Hernandez, making it 5-0 early. Andy Suarez actually pitched pretty well and probably deserved better–a little fly ball by rookie Juan Soto became a two-run homer when Pence took a poor route and mistimed his jump. When a couple grounders got through and the score got a bit too close, Bochy pulled him with one out in the fifth, costing him a chance to earn a win. I was impressed with Suarez’s ability to pitch out of trouble in the first inning, when with Trea Turner at third with one out, he bore down and struck out Rendon and then Reynolds to get out of the jam. I guess Suarez likes humidity (he’s from Florida) because he was flashing some impressive stuff in that inning. Andy Suarez is throwing 89 mph sliders and hit 95 with his fastball. That's an interesting development. Anyway, it was a great start to a tough road trip for a team that’s played poorly on the road and especially has had trouble hitting on the road. As Alex Pavlovic pointed out in his gamer, the Giants oddly have hit much better at home than on the road this year, and going into last night’s game had averaged the fewest runs on the road (3.38) of any National League team. Several of the most fun surprises were in full display last night. Two of them are journeymen who have given the Giants an unexpected spark this year. Alen Hanson roped an easy triple. Gorkys Hernandez brought him in with his seventh homer. Some Giants scouts are owed raises. Another one, and we’ve gotta give it up for him, is Pablo Sandoval. Since Belt went out with appendicitis a week ago, Sandoval has taken over at first base most days. In his last seven games, he’s 10 for 28 (.358) with two homers (and a slugging percentage of .643, including last night’s classic-Panda double to the left-center gap). Pablo’s showing that rumors of his career’s demise may have been premature. Thanks for that, Red Sox! As the announcers pointed out last night, Pablo seems to have reinvented himself as a…patient hitter? Check out this analysis from Fangraphs. The Giants, dare I say it, finally seem to have some depth. Reyes Moronta earned the win Friday. He's 2-0. Rookies have won nearly 1/3 of the Giants games this year. Let’s check on this. The Giants have won 32 games. Moronta has won two, Pierce Johnson has won three, Andy Suarez has two wins, and Dereck Rodriguez, today’s starter, has one. Add one for Roberto Gomez, who was with the Giants back in March/April, and that’s nine wins credited to rookie pitchers. It could have been even more, as two other rookies (D.J. Snelten and Tyler Beede) have appeared in games for the Giants. Giving all due credit to the Brandons and Johnny Cueto and a surprisingly deep and talented bullpen, the story of why the 2018 Giants are right in in the NL West race and over .500 for the first time since May 15 is the surprises and the rookies. Just like we all predicted back in March, right? So why a June 9 declaration of goodness? The Giants still have their problems, most notably a shaky rotation full of question marks (the injuries to Cueto and Samardzija) and unknowns (rookies and relatively still-green starters like Stratton and Blach). But it’s not hard to imagine the rotation actually becoming a strength over the coming weeks and months if their two horses can come back healthy and if one or both of the rookies look like they can continue to contribute. Some things would have to break the right way, sure, but maybe the Giants are due for some good luck after 2017. A month ago, Cueto was going to see Dr. Andrews. Panik beat the time line on his return from thumb surgery. And raise your hand if you thought Melancon would be back by now. Now raise your other hand if you’re a liar. I see those hands! 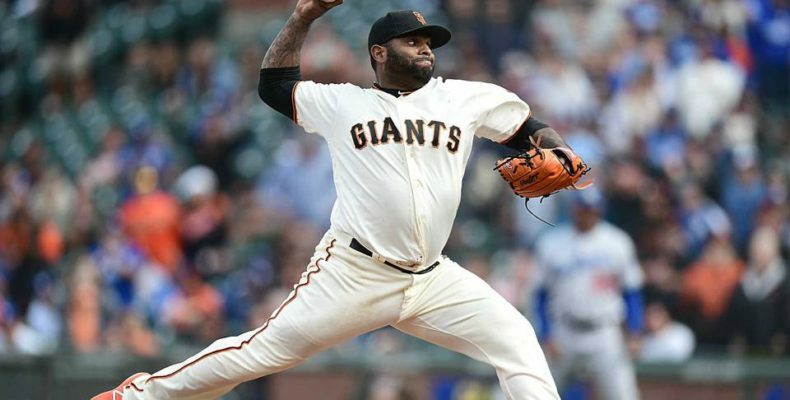 The Giants strengths are a deep lineup and a solid bullpen that gels more with each week that goes by. And there’s plenty of time for people to get healthier and youngsters to develop. If the Giants go into a tailspin, you can go right into the TWG archives and throw this back at me in a month or two. But I’ll get off the fence now. The 2018 Giants are good and getting better. Since the Nats have a charity event or something tonight, everyone gets to be at it bright and early today. Warriors fans who were celebrating last night will be staring at the game through bleary but happy eyes. Here’s the Giants’ lineup for today. 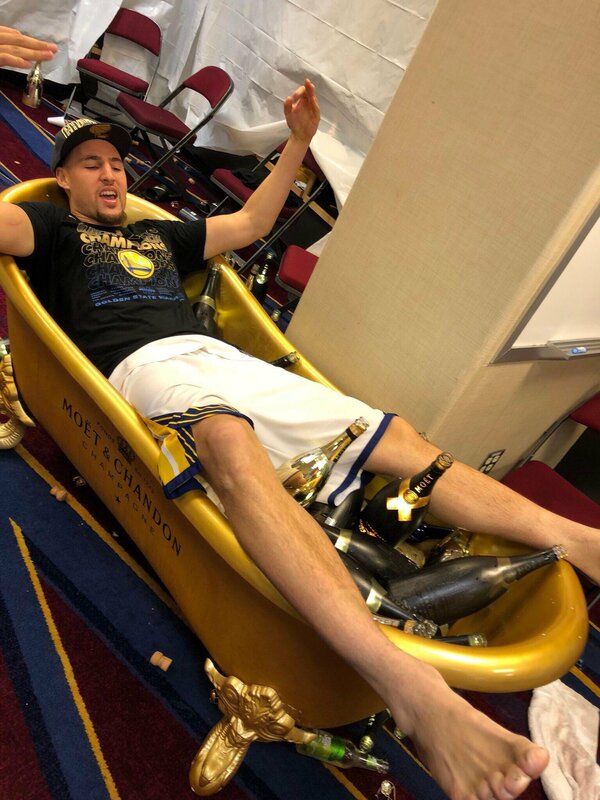 In the meantime–be like Klay Thompson. Lefty out.